↑ Clocks are advanced by an hour from the last Sunday in September until the first Sunday in April. 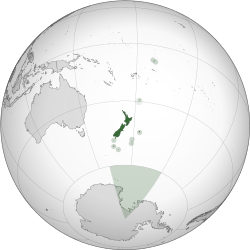 Daylight saving time is also observed in the Chatham Islands, an additional 45 minutes ahead. ↑ "The New Zealand Land Cover Database". New Zealand Land Cover Database 2. Ministry for the Environment. 1 July 2009. पहुँचतिथी 26 April 2011. ↑ "Population clock". Statistics New Zealand. पहुँचतिथी 14 April 2016. The population estimate shown is automatically calculated daily at 00:00 UTC and is based on data obtained from the population clock on the date shown in the citation. ↑ 3.0 3.1 3.2 3.3 "New Zealand". International Monetary Fund. पहुँचतिथी 9 October 2018. ↑ "Income inequality". Statistics New Zealand. पहुँचतिथी 14 June 2015. ↑ "Human Development Report 2018" (PDF). HDRO (Human Development Report Office) United Nations Development Programme. प. 22. पहुँचतिथी 14 September 2018. ↑ "New Zealand Daylight Time Order 2007 (SR 2007/185)" (English में). New Zealand Parliamentary Counsel Office. 6 July 2007. पहुँचतिथी 6 March 2017.